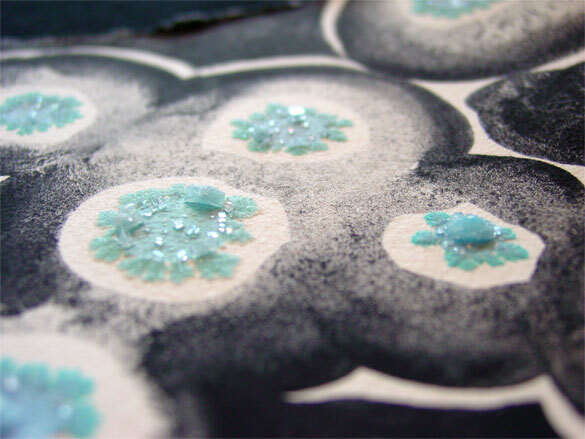 It’s always fascinating to me how the different colors of ink react to the salt — some of them don’t actually spread into the halo of crystal formations, but this one took its rich blue color all the way to the tips, leaving the darker, more violet-toned ink behind in the central circle. 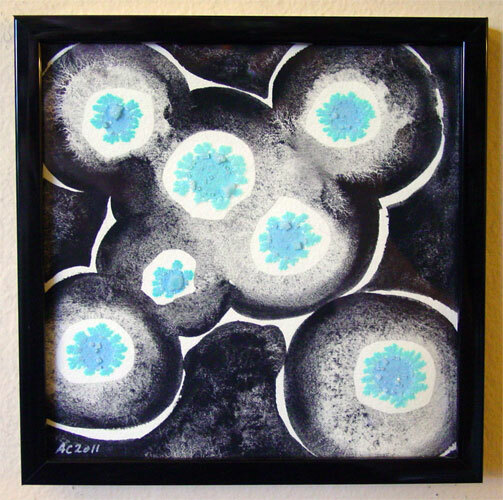 This piece combines the blue snowflake-like salt formations from Snowflakes with the fascinating brushwork from Aglow 2 to get an entirely new effect that reminds me of a pattern from the ’50s or ’60s. Modern Snow, 5″x5″ mixed media on paper, $555, framed, with free shipping. Like all the paintings I made using the lunar black, this one’s got the gorgeous contrast between the velvety dark areas and the sparkling salt crystals. A simple frame will keep your art safe from damage, even those strange sideways crystals that grow at odd angles out of the paper.